Decree 602/2018, issued by President Abdel-Fattah Al-Sisi on 30 December, establishes a Supreme Council to Combat Sectarian Strife. According to the official gazette, the council will be mandated to formulate a general strategy to prevent and contain sectarian violence, developing “new mechanisms to contain such incidents and issuing periodical reports” on their success. The council will be headed by Magdi Abdel-Ghaffar, President Al-Sisi’s counter-terrorism advisor and a former interior minister, and include representatives from the Armed Forces, national security and intelligence agencies. It will be authorised to invite ministers and other concerned officials to attend its meetings. Al-Sisi’s decree was issued just a few days ahead of Coptic Christmas celebrations and before the president opened a major mosque and the largest cathedral in the Middle East in Egypt’s New Administrative Capital. Islamist jihadists have long sought to target churches at Christmas time and during other Coptic feasts. Heavy security measures were in place during this year’s celebrations with roadblocks and police deployed en masse around churches to prevent car bombs and other attacks. 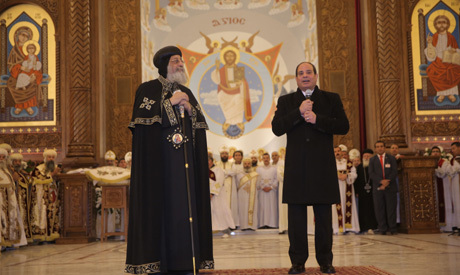 Al-Sisi’s initiative to confront sectarian violence was welcomed in religious and political circles. Egypt’s Grand Mufti Shawki Allam described it as a “qualitative shift towards citizenship”. Coptic Orthodox Church official Kamal Zakher said it was a “positive step in confronting sectarian and terrorist incidents”. The council’s level of representation is a sign the authorities are willing “to address the problem’s root causes”, says Al-Ahram political analyst Nabil Abdel-Fattah. He added that the decree establishing the council comes parallel to the president’s order in July 2017 to form a National Council to Combat Terrorism and Extremism. Kamal Amer, head of parliament’s Defence and National Security Council, says the council could be an important vehicle in fighting sectarian incidents that seek to divide Egypt’s Muslims and Christians. According to Abdel-Fattah, the government’s traditional approach to containing sectarian strife fuelled the situation. Legal expert Fouad Abdel-Moneim Riad wrote in Al-Ahram on 12 January that President Al-Sisi’s decree should be followed by other measures to help contain sectarian incidents.